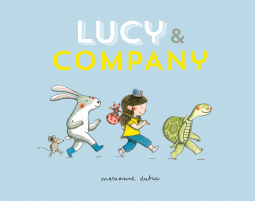 Lucy & Company is a very cute picture book for little kids. It consists of three very short stories about Lucy and her friends' adventures, such as going on a treasure hunt, surprising a friend with a birthday party, watching chicks hatch, and sharing a snack among friends. The stories are simple and uncomplicated in their plot, and give kind of comfort in their resolution, making them ideal for the age range. As in all Dubuc's works, the art is beautiful and the best part or the book.